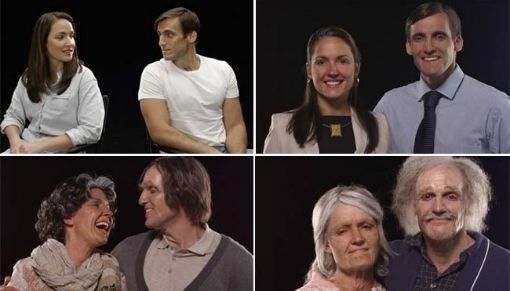 This video of a young twenty-something couple about to get married who allow themselves to be aged several decades from their 20's into their 90's, while getting to see each other and comment about each iteration, is surprisingly insightful and very touching. What I loved most was how much they laughed and commented on how "they" had aged and how they felt about the other each time. They seemed so sincere and genuinely touched (especially the last couple transformations) as they discussed what life might be like for them then. I also loved (in the 70's reveal) how she said to him "I hope I'm taking better care of your hair at this age." And I definitely didn't cry at all towards the end.